The little known Tutupaca volcano (17° 01′ S, 70° 21′ W), located at the southern end of the Peruvian arc, is a dacitic dome complex that experienced a large explosive eruption during historical times. 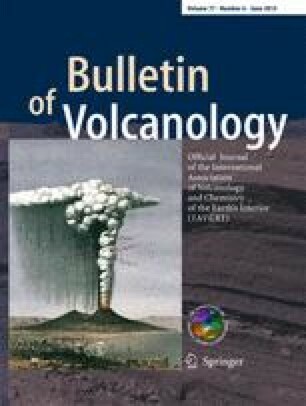 Based on historic chronicles and our radiometric data, this eruption occurred 218 ± 14 aBP, probably between 1787 and 1802 AD. This eruption was characterised by a large sector collapse that triggered a small debris avalanche (<1 km3) and an associated pyroclastic eruption whose bulk volume was 6.5–7.5 × 107 m3. Both units were emplaced synchronously and spread onto the plain situated to the northeast of Tutupaca volcano. The spatial and temporal relationship between the debris avalanche and the pyroclastic density current deposits, coupled with the petrological similarity between the juvenile fragments in the debris avalanche, the pyroclastic density current deposits and the pre-avalanche domes, indicates that juvenile magma was involved in the sector collapse. Large amounts of hydrothermally altered material are also found in the avalanche deposit. Thus, the ascent of a dacitic magma, coupled with the fact that the Tutupaca dome complex was constructed on top of an older, altered volcanic sequence, probably induced the destabilisation of the hydrothermally active edifice, producing the debris avalanche and its related pyroclastic density currents. This eruption probably represents the youngest debris avalanche in the Andes and was accompanied by one of the larger explosive events to have occurred in Southern Peru during historical times. This work is part of a Peruvian–French cooperation programme carried out between the Instituto Geológico, Minero y Metalúrgico (INGEMMET, Peru) and the Institut de Recherche pour le Développement (IRD, France). It was partially founded by a “Jeunes Equipes Associées à l’IRD” (JEAI) project that is an initiative designed to promote and strengthen new research teams in developing countries. We warmly thank Etienne Medard, Pierre Delmelle, Marie Detienne, Karine Bernard, Marco Rivera and Jean-Luc Le Pennec for fruitful discussions on the field and Fran van Wyk des Vries for the english improvement of the manuscript. We are grateful to the two anonymous reviewers for their comments and with S. De la Cruz-Reyna and J.D.L. White for the editorial handling. This research was financed by the French Government Laboratory of Excellence initiative no. ANR-10-LABX-0006, the Région Auvergne and the European Regional Development Fund. This is Laboratory of Excellence ClerVolc contribution no. 159.